13 Years In Jail For Writing On A Sidewalk With Chalk? : The Two-Way In San Diego, 40-year-old Jeffrey Olson is on trial for writing messages such as "No Thanks, Big Banks," on sidewalks. He was protesting the financial mess some banks got into and the federal bailout that followed. Should be be prosecuted for expressing himself in erasable ways that weren't obscene? 13 Years In Jail For Writing On A Sidewalk With Chalk? 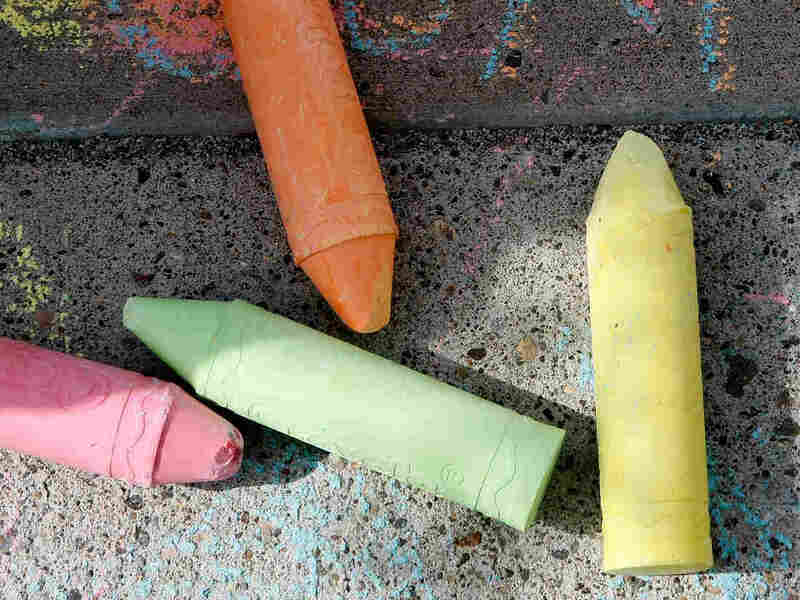 Sidewalk chalk: The tools of a criminal? There's no evidence that he wrote anything obscene. His messages could be easily erased. And they don't seem to have upset many, if any, people. But in San Diego, 40-year-old Jeffrey Olson is on trial for expressing his opinions on sidewalks outside three Bank of America branches. He's charged with 13 counts of vandalism. Jury deliberations began Friday, our colleagues at KPBS say. If convicted on all counts, they add, he faces up to 13 years in prison. Just what did Olson say on the sidewalks from February 2012 to August 2012 that led to complaints from the bank and the vandalism charges? -- "No Thanks, Big Banks"
-- "Shame on Bank of America"
The messages were "always on city sidewalks, washable chalk, never crude messages, never vulgar, clearly topical," Olson told the local CBS affiliate before the judge imposed a gag order on the prosecution and defense. "If the city loses the case, it might be chalked up to jurors who question if the city should be spending taxpayer money bringing charges against someone who plied his activism — or vandalism — using something that can be easily washed away with a hose. "During jury selection, Deputy City Attorney Paige Hazard asked 12 potential jurors if they thought the case against Olson was a poor use of taxpayer money. At least six hands shot up.
" 'I think this is a tremendous waste,' said one." We have a question (not a scientific survey of public opinion).